The stripes were painted in four LVX shades. 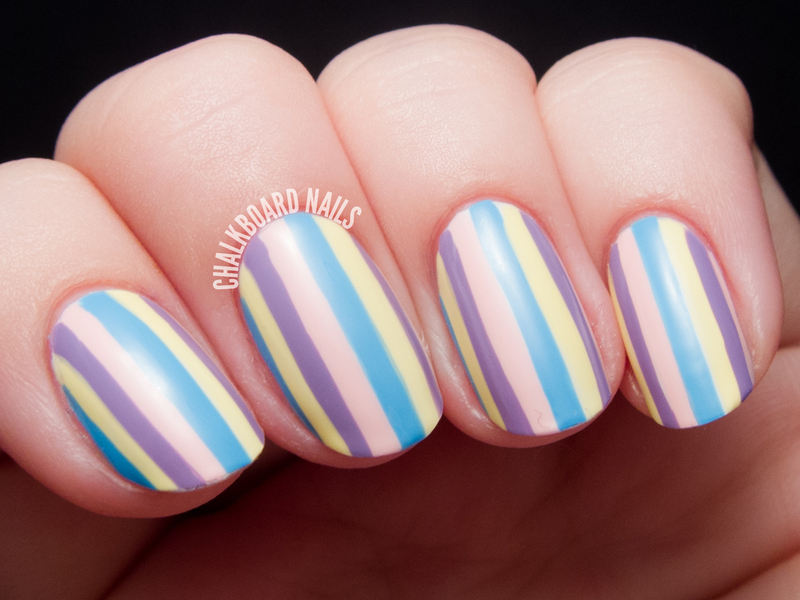 Using a small nail art brush, I painted vertical stripes beginning in the middle of my nails and working outward towards the edges. Lolli photographed a bit pale here -- it's really a nice soft bubblegum shade. The other colors look accurate to my eye. After snapping photos of just the stripes alone, I added a coat of Formula X Thunder over the top. 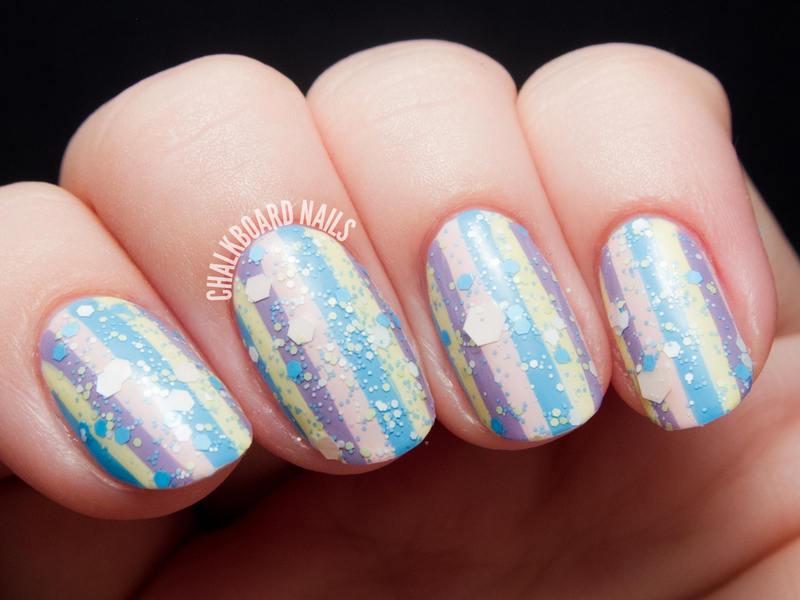 It has a great mix of pastel glitters that really complemented the palette of the stripes. I love the way it came out. Which way do you prefer it: with the glitter or without? Both of them look nice but if I had to choose, I think I like it better without the glitter. I agree with you, glitter over nail art usually does not make it better, but I have to admit that I prefer the glitter version this time! Looks great with the glitter. I like them both but I think the glitter wins for me. (I'm always on glitter's side.) 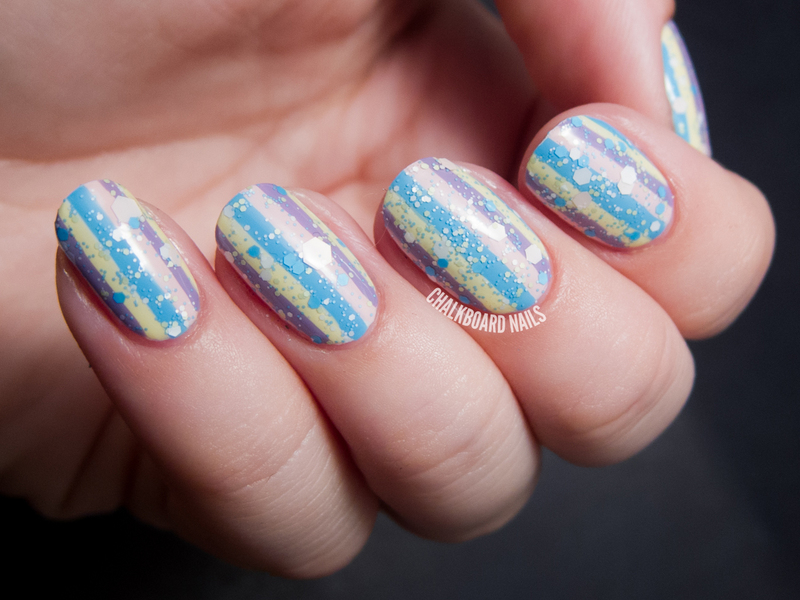 I like that it looks like the glitter is just floating over the stripes. I love the colors, too. There is something nice and clean about it -- though I think I prefer it with, myself. I usually side with cremes, but this look ended up so structured yet chaotic that I just kinda love it. I actually don't drink coffee! But the steadiness comes from years of practice, haha. Looks amazing! I love the glitter on it too - I really love those Formula X neon matte glitter toppers! I'm just your new follower;p Your nail art designs look AMAZING!!!!! Beautiful! I love both versions, the stripes on their own look sweet and sophisticated, whereas the glitter adds a playful and fun touch! This is beautiful! Nice choice with that glitter! I need to pick up a few more of them, for sure. I did! Thank you very much! Love it! From a distance it really looks like you splattered over the nail and I was like "how did she do that so perfectly?!" I love the randomness and shape of the complimentary glitters over the structured stripes. 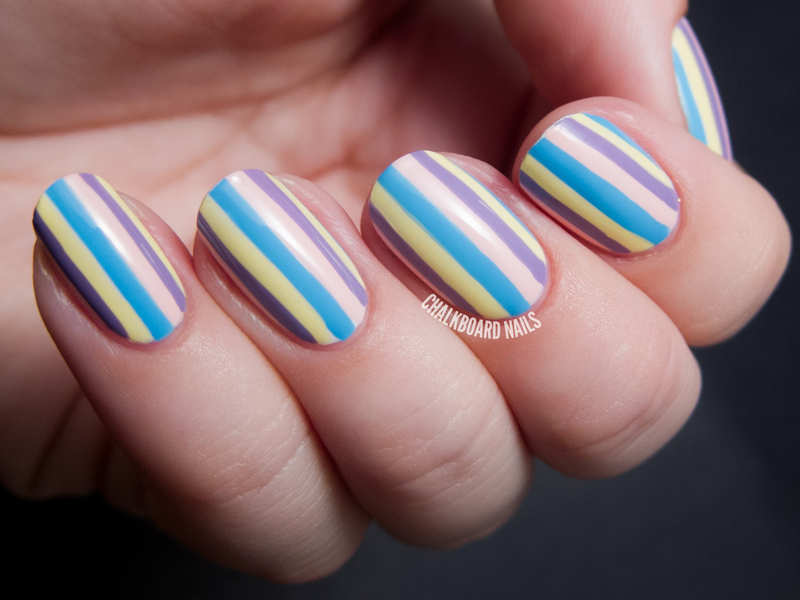 I have never cared for vertical stripes on nails - always thought they were too 'stiff'. Lol, I never thought to put the right glitter over them! Thanks for the inspiration! Oh man, wouldn't it be nice to control a splatter? Thanks! Thank you! I think I'll have to keep doing this! Thanks, I love pastel shades as well! You're exactly right about the similar color palette. It looks like the glitter is popping out at you. I'll have to try this next time I do a layering combo! both versions are equally fantastic. i find i get bored pretty quickly with my manicures so doing a stripe version until it starts to chip on me then adding a glitter top would be a way to have a manicure last 4 or 5 days. This looks so cool! I would have never thought to add the glitter to the stripes! I guess that's why you're the nail artist! LOL!